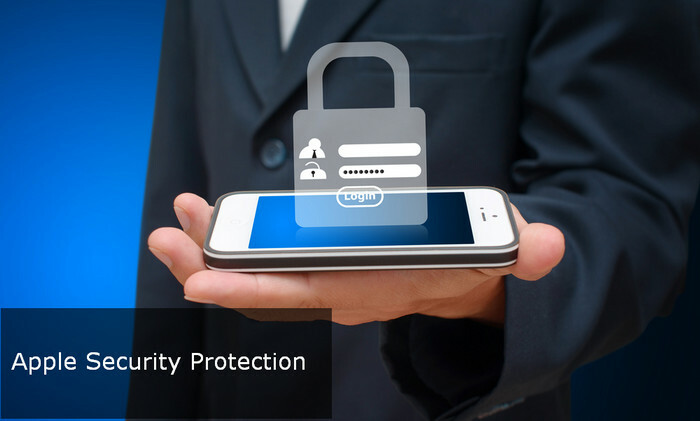 This article provides an effective Apple antivirus solution to possibly prevent iPhone Xs, XR, X, 8, 7, iPad Air 2/3, mini 3/4/5, iPad Pro, iPod touch from being infected by any virus and Trojans for iPad iPhone security. Some iOS apps contain potential malware. Even worse, some suspicious programs are hidden in some online videos, especially for jail broken iPhones and ipads. So when you are watching or downloading movies/videos online, your iPhone, iPad or iPod may get infected by viruses and Trojan horses, which cause your iDevice supervised, slow down, or even out of work. Once infected, your iPhone, iPad or iPod is hardly to be cleaned again. Therefore, considering of iPhone iPad iPod security, it is really not a wise action to unlock or jailbreak your iPhone iPad iPod, let alone the fact that it is illegal. 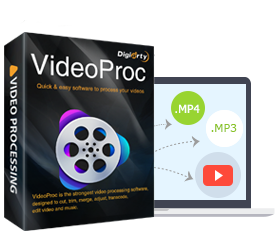 Rip your copy-protected DVD to iPhone iPad iPod friendly videos at fast speed, so that you can play back the movies of all existing DVDs on your device on the go! It can also convert DVD to AVI, MPEG, MOV, 3GP, MOV, MP3, etc. for other uses. Convert your existing videos/movies to be playable on iPhone, iPad, iPod, and so on, in support of any video formats including MKV, AVCHD, TS, MTS, M2TS, MOD, QT, VOB, ASF, RM, RMVB, WebM, VPX 8, etc. With both or either of these two tools, you can enjoy HD videos on iPad iPhone Android smoothly without the need to worry about the bandwidth usage, network stability and cell phone security in watching movies and listening to the music. Step 1: Install and launch WinX DVD Ripper Platinum or VideoProc on your computer. Step 2: Make sure that the DVD or video file to be ripped/converted has been in your DVD-ROM or hard drive. Step 3: Click "DVD Disc" or "+Video" to add DVD/video content. Step 4: Find "Apple Device" in Output Profile, choose one profile fitting your iPhone (8/7/7 Plus/6S/6S Plus/6/5S), iPad (2, 3, 4, iPad mini/2/3/4, iPad Air/2), iPad Pro, iPod touch (1-6), iPod Classic, iPod nano, etc. You can also customize the output video quality and balance the file size and definition degree. Step 5: Select destination folder and make some personal settings according to your own preference. 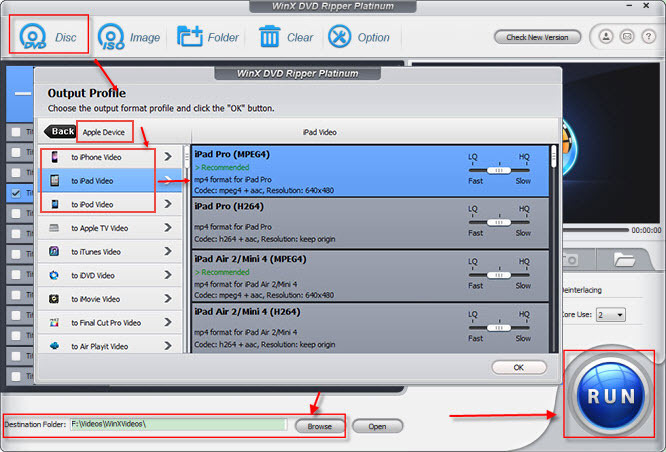 Step 6: Click RUN and start the amazing DVD/video to iPhone iPad iPod conversion. When the conversion is completed, you can use WinX MediaTrans, the world's fastest mobile transfer software, to sync it to your iPhone, iPad and iPod for offline watching. 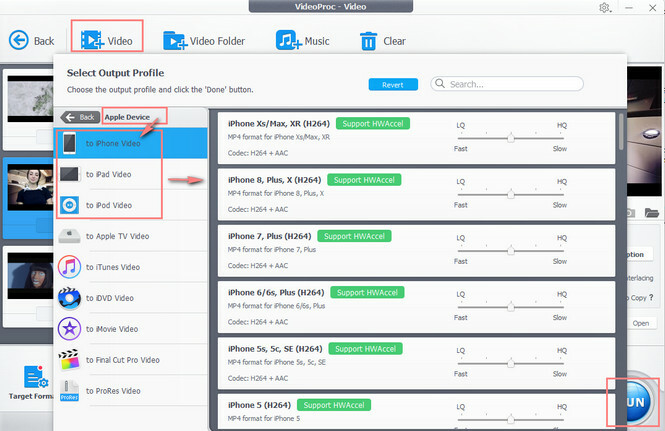 You can use it to transfer the movies/videos to iPhone iPad Android from your PC/Mac without losing quality. WinX MediaTrans also helps you auto convert any video to MP4 and rotate video for iPhone iPad full screen playback. Digiarty suggests several ways to steer by Android Trojan and Malware for users used to watching videos on Samsung, HTC and other Android phones and tablets. How to convert an ASF file to MP4 making it playable on more players and devices? The following 2 ways can achieve this transcoding task easily and quickly.